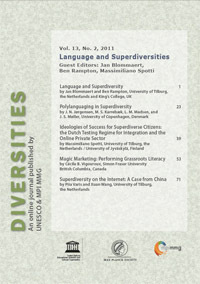 This paper explores the scope for research on language and superdiversity. Following a protracted process of paradigm shift, sociolinguistics and linguistic anthropology are well placed to engage with the contemporary social changes associated with superdiversity. After a brief introductory discussion of what superdiversity entails, the paper outlines key theoretical and methodological developments in language study: named languages have now been denaturalized, the linguistic is treated as just one semiotic among many, inequality and innovation are positioned together in a dynamics of pervasive normativity, and the contexts in which people orient their interactions reach far beyond the communicative event itself. From here, this paper moves to a research agenda on superdiversity and language that is strongly embedded in ethnography. The combination of linguistics and ethnography produces an exceptionally powerful and differentiated view of both activity and ideology. After a characterization of what linguistic ethnography offers social science in general, this paper sketches some priorities for research on language and communication in particular, emphasizing the need for cumulative comparison, both as an objective in theory and description and as a resource for practical intervention.